After nearly twenty years in the same location, we have decided to move our business to new quarters--a newer, nicer building just down the street. We hope everyone will stop by to say hello. Our phone numbers remain the same and of course, we still offer all the quality fabrication and window treatment design services you've come to expect. New beginnings! We're excited. IF YOU ARE MOVING don't forget your windows! We're experts in designing window fashions to complement your decor...and we'll resize your favorite treatments for your new home too. All the new trims coming out for spring are just fabulous and trim is a great way to dress up your home decor. It gives a finishing touch to draperies and cornices and adds that special touch to upholstered headboards and custom bedding. For outdoor rooms, Sunbrella has a great line of tassels and trim in sunny outdoor colors. The new jute trims offer a variety of options for a natural, casual look. Choose trims that complement the colors in your fabric or decor. If you have a plain fabric, an ornate trim can make it look formal whereas a simple trim can give you a clean, more contemporary look. A quick, fun way to add color to your room is with pillows. They can be almost any style and size from formal to frivolous. Pile loads of them on your bed. Toss a few on your sofa. Scatter them on the floor. Wherever you use them, you definitely notice their impact. They can tie the colors of your palate together, add a splash of color to an otherwise neutral setting, or set the tone of your room. Don't forget, they are one of the easiest and most cost effective ways to update a room. 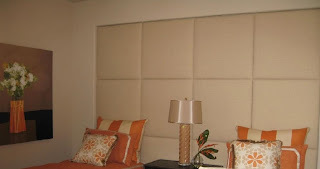 Nothing changes the look and feel of your bedroom like a new upholstered headboard. 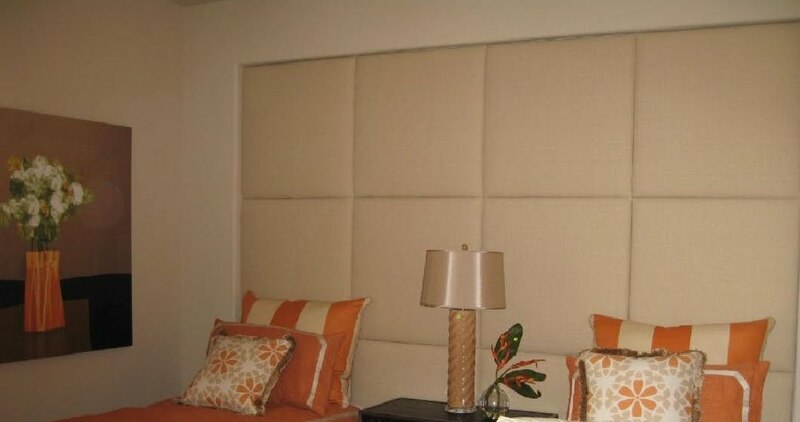 Whether it's an entire upholstered wall or a traditional headboard, it becomes the focal point and sets the tone for the rest of the room. There's so many beautiful fabrics on the market that offer a collection of coordinating prints so you can incorporate the feel of the headboard into your bedding without looking too matchy matchy. Shown are a few we've done. Is your favorite sofa looking tired and outdated? If you love the comfort and style of your old sofa but it's looking worn and dated, you might want to think about reupholstering it instead of replacing it. By reusing what you have, you'll save running around looking for that "perfect" piece and you'll help reduce your carbon footprint too. If the cushions are sagging, your upholsterer can help you with that by replacing the foam cushions, or by adding new webbing. Look for fabrics that coordinate with your window treatments, add a few new pillows, and you'll find the whole look of your room has changed. Custom upholsterers can also manufacture furniture, so if you've always wanted an ottoman that matches your sofa, ask your upholsterer about the many styles available. With one stop, you can have smart "new" seating without having to shop for coordinating pieces. Nothing pampers you like a bedroom dressed in luxurious bedding. We've done many layered looks with bedskirts and comforters and lots and lots of pillows, but if you want a more tailored look with some softness, why not try a shirred bedspread with bolsters instead of pillows? The look is inviting and elegant but not fussy.Detailing like the decorative tassel and contrast welt adds interest. We lined this bedspread with black satin and used black cording. The economy has many people scrambling to keep costs down and often that means they're staying at home more and spending less on outside entertainment. It's a great time to focus on what makes you comfortable at home. Simply changing out your window treatments, adding a new valance over existing treatments, or putting a splash of new color on your sofa or your bed with bright, cheerful throws and pillows can provide you with a great new look without breaking the bank. Maybe you're draperies are looking tired. A new valance or cornice can frame them and provide a striking accent to what you already have. The addition of sheers under the draperies will give you a softer, more light filtered look and that creates a whole new ambiance in the room. A coverlet and new shams can give your bedroom a fresh update. By changing only a few things, or layering over what you already have, you can have a fresh new look with a small investment. What is your favorite drapery look?